Properties in Fort Beach average 4.6 out of 5 stars. Kitnet Guaratuba on the main Av 4 qdras of the sea kitnet p 2 or up to 8 people. Property 5: Kitnet Guaratuba on the main Av 4 qdras of the sea kitnet p 2 or up to 8 people. Property 8: Excellent house, for families of up to 8 people. With wireless internet and air cond. 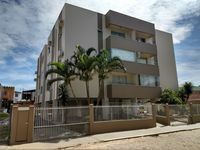 Property 15: Residencial Mariana - Apt of 01 bedroom with swimming pool. Property 19: House 4, with pool and barbecue, for up to 8 people, in Itapoa SC. Property 20: House with pool, air, WIFI, soccer field, up to 16 people. Property 29: Apartment in closed condominium with swimming pool. House with swimming pool 700 mt from the beach. Property 31: House with swimming pool 700 mt from the beach. Property 32: Two floors with 2 apt, 100 meters from the sea Sleeps up to 10 people per room. Property 36: Townhouse Capri / SC - Sleeps Great Family w / room for fun of children. Property 39: House in Guaratuba three blocks from the beach and next to the Curaçao Café. Property 50: Casa Itapoa SC 50m from the sea!